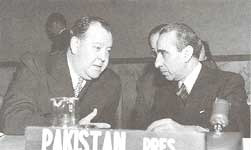 Professor Bokhari was President of the UN Security Council during April 1952. The delegation that inscribed its name next on the list of speakers is the delegation of Pakistan. If my colleagues have no objection, I shall now proceed to speak in the capacity of representative of Pakistan. My delegation has listened to the intervention of the representative of France with the care and the interest that it fully deserved. I was happy when I discovered that he had expressed the desire to be the first to speak in the procedural debate regarding the adoption of the agenda. I was, however, surprised when he stated that his delegation would vote against the inclusion of this item in the agenda. I was surprised, not because I did not expect such an attitude on the part of the delegation of France but because, having shown his strong disinclination to having this item included, the representative of France nevertheless made a speech which could only have been made if the agenda had been adopted. He did so because, obviously, he felt the need to do so, showing thereby that there was need, at least on his side, to discuss this question fully. This being so, it is a matter of surprise to us that he should then declare that he would oppose the adoption of the agenda. This could only mean that while he himself wanted to have the opportunity, did have the opportunity, and actually used the opportunity, to make a speech as though the agenda had been adopted, he wished to preclude others from doing the same. Of course, amongst the others, those who sit around this table could not be excluded because they are entitled to take part in the discussion exactly as the representative of France himself has seen fit to do. But it was a little unfair to have made a speech and presented the point of view of France so very ably, I may say - as though the agenda had been adopted, and then, by opposing its adoption, to seek to refuse the same opportunity to ten other delegations which have written in to the Security Council. If one is to follow the logic of the speech made by the representative of France, it is not only necessary to adopt the agenda; it is necessary forthwith to ask the ten delegations -member nations which have approached the Security Council on this matter - to take their seats at the Security Council table to oppose their point of view to the French point of view. The representative of France went further. He read out passages from the explanatory note which the ten delegations had appended to their letters and such unpleasant remarks -unpleasant to him - as he thought needed countering. He not only did his best to counter them, but he also called them slander. In other words, he accused eleven nations of having made a slanderous statement against the Government of France. Against this accusation, I, speaking as the representative of Pakistan, protest -and I am sure that the other ten delegations, had they the chance to speak, would also protest. It was not our business, our intention or our desire to slander either his great country or his Government in any irresponsible manner. The representative of France has made various suggestions and innuendos. For example, he has suggested that we, the ten or eleven gullible nations, foolishly listened to certain irresponsible persons in the corridors of the Palais de Chaillot and thereupon took action which we ought not to have taken. I am glad he has mentioned this because it gives me the chance to say how great was our patience and our sense of responsibility and after what great reluctance we have brought this matter to the attention of the Security Council. As the world now knows, two Ministers of the Government of Tunisia two Ministers who, so far as I know, as long as they were Ministers of the Government of Tunisia, enjoyed the confidence of the Government of France - came to Paris and wrote a letter to the President of the Security Council, drawing the attention of the Security Council to a certain sad and lamentable state of affairs in Tunisia. Nothing came of that letter. It lay in the archives of the United Nations for a long time. It did not officially see the light of day either in the Palais de Chaillot or in this mansion of many windows. It lay there until my delegation asked that copies of it should be circulated. After that, although we knew that this letter had been lodged with the President of the Security Council and although we knew that, during the same days, massacres, riots, arrests, sabotage were taking place in Tunisia - I mention merely the acts of violence; I have no intention at this stage of apportioning blame to anyone - although we knew this, we waited patiently in the hope that the French Government in its wisdom would realize the gravity of the situation and try to come to an amicable understanding with one of the most gentle people on the face of the earth. We waited for many days. We parlayed. We discussed the matter amongst ourselves. We made informal and friendly approaches to the French Government through various channels. Nothing happened. We realized that this was a matter of grave importance but not one in which we should be in any indecent haste to embarrass the French Government provided it was full of good intentions, which we hoped it was. There was a strong feeling that the matter should be raised in the General Assembly in Paris during the last weeks or even earlier. However, wiser counsels prevailed. We were asked to be patient. Fifteen nations in a body went to the President of the General Assembly, Mr. Padilla Nervo, and begged him to approach the French delegation and, through it, the French Government, and ask it, in the name of peace, security and friendly relations among nations, not to drive the Tunisians to a point of desperation. Otherwise, feelings in our own countries, which are most sympathetic to the cause of the Tunisians because they are a suppressed nation, would run high. The President of the General Assembly promised to convey our message. He did. We waited. It was not the Tunisian Ministers who wandered up and down the corridors of the Palais de Chaillot; it was we who did so. We waited for an answer, a gesture of some sort. No answer and no gesture were forthcoming. After another wait, we went again to the President of the General Assembly and once more begged him to convey our feelings to the French Government through such channels as he thought best. We told him that the most natural and the most normal thing for us to do would be to give vent to our feelings in the General Assembly. But during the last days of the Assembly, we did not want to make the task of the United Nations difficult and complicated. He then promised to convey our message to the French Government. We presumed, I am sure, he did. Nothing came of it. We then asked ourselves whether we should raise the matter in the General Assembly. However, we were handicapped considerably because not long ago, the same nations whose names are now inscribed on this complaint, had had a most lamentable, unfortunate and unhappy experience. Some of us had tried to raise the question of Morocco in the General Assembly. This item on the provisional agenda had to go to the General Committee where nations such as those with their names on this document did not have a majority. The General Committee did not allow that item to be discussed. True, it said that the discussion of this item should be postponed for the time being. But we know very well that the words "for the time being" merely meant stalling and indefinite postponement. The matter came to the plenary session of the General Assembly and representative after representative spoke very strongly about it. But we did not succeed even in getting that item on the agenda. Disappointed, we still thought we would wait. Indeed, we came over to New York. We discussed the situation amongst ourselves. Every day, we read the news in the press. Every day we hoped for some signs of improvement. Everyday we hoped for some sign of better understanding between the French and the Tunisians and we prayed for the safety of the Tunisians and of the French Republic. Every day, the news got worse and worse. We then thought that perhaps we should not rely entirely and solely on newspapers. Perhaps it would be best to see if we could not get some Tunisians over to New York so that we should cross-examine them and find out exactly what the situation was before we, as responsible delegations, took the matter to the Security Council. We found that there were insurmountable difficulties in the path of the Tunisians coming to New York. We understood that the diplomatic passports of responsible ministers were taken away from them. I would be very glad if the representative of France would contradict this statement. I would be only too happy to listen to his contradiction. The fact remains that we understood that owing to passport difficulties they could not come. We tried desperately to have other people come. There were all sorts of difficulties in their way, too. Then, very great friends of all the nations whose names are given here told us that the French Government, which was then going through a parliamentary crisis, could hardly be expected to take any clear action in this matter with such a great problem as the parliamentary crisis facing it. We were not full of optimism but we thought that it would at least be chivalrous on our part, if not wise, to wait until a government in France was stabilized. The Government was stabilized. We were happy for the sake of France. We were full of hope that now that the Government had been stabilized, a step forward would be taken. A few days after the stabilization of the Government, we found that not only did the situation in Tunisia not improve but, to our dismay, horror and surprise, the entire cabinet was arrested by the French Republic. When I say the entire cabinet, I mean all those whom they could get hold of. I understand that the French have not been able to arrest two members of it. This was the cabinet which had been set up in Tunisia as a result of a great rapprochement between these two Governments in the year 1950, and that was to negotiate reforms with the Government of France for a better understanding between these two great nations. This cabinet found itself in jail. It comprised the last of the most prominent Tunisians to go to jail. Every other nationalist leader of the Neo-Destour Party, which undoubtedly has the largest following in Tunisia, was already in jail. Not only that, but according to our information - and I should be glad to hear it contradicted - thousands of people were in concentration camps, hundreds of Tunisians had been killed and it was difficult to get information from certain parts of Tunisia. We waited. We said, "After all, we cannot be more Catholic than the Pope himself. If the Tunisians form another Government and it works smoothly, we should have nothing about which to worry." We waited. After days and days, we found that a gentleman by the name of Baccouche had been appointed Prime Minister. We looked up his past record. We asked such people as knew the Prime Minister of Tunisia about his past history. They told us that this gentleman had at one time been a civil servant, that he had occupied the position of Prime Minister I for a little while during the war years, that he was a man with no great following in Tunisia and that he was the only person who, under French pressure, so we understood, was willing to risk his neck to be appointed Prime Minister. We were told that he was to form a cabinet. We waited. Days passed. Mr. Baccouche, in spite of being the Prime Minister, of having the sympathy of the Resident-General and the support of the French Government, cannot form a cabinet. According to reports appearing in The Herald Tribune or The New York Times, when this gentleman goes to see Bey, so great is the resentment that he arouses amongst people of Tunisia that he goes into the palace by the back door. The Prime Minister, or the French, did by the use of pressure persuade one other person to become a Minister -one person. But when the time actually came for him to be appointed Minister, he found that public feeling was far too much against him. Then, very wisely, deciding that discretion would be the better part of valour, he refused to be Minister whereupon the French threw him into gaol. It seems to me that, nowadays, Tunisia is a Utopia in reverse: either you become a Minister or, if you refuse to become a Minister, you become a prisoner. We tried to find out what had happened since the arrival of Mr. de Hauteclocque - who, I understand from the representative of France, had gone to Tunisia with new reforms, with a promise of hope for the Tunisian people. We gathered information. For the benefit of other representatives at this table, I should like to read out a few sentences which give a description of Mr. de Hautecloque' s arrival in Tunisia, the country which he has gone to befriend, the country to which he is going to give freedom and reforms - according to the French claim. Mr. de Hauteclocque arrived in Tunis on 13 January. His arrival was made an occasion of the greatest display of force ever seen there. He landed from a cruiser. The whole town was occupied with troops, with armoured cars, with tanks, and all the streets through which he passed were lined with troops. It was not an ordinary reception, but a display ofmight. From his first intervention with the Bey, the Resident-General gave him to understand that he would like to maintain direct contact with him. The Prime Minister, however, informed the Resident-General, in the name of the Bey, that all official contacts should take place through the Prime Minister. 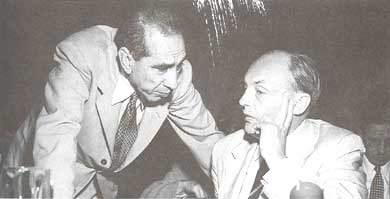 When the Tunisian Government submitted its complaint to the United Nations, on 14 January 1952, the Resident-General demanded an interview with the Bey alone, but the latter refused and directed him to the Prime Minister instead. On the 15th, the Resident-General agreed to be received by the Bey in the presence of the Prime Minister. Thereupon, he demanded: first, that the complaint should be withdrawn; second, that the Ministry should be changed; third, that the Bey should sign two decrees, the first appointing the Resident-General as Foreign Minister, the second appointing General Garbay -a name one associates with great military action in Madagascar - as Minister of Defence. The Bey instructed the Prime Minister to answer the Resident-General. The Prime Minister's answer is on record. The Prime Minister said he had been authorized by the Bey to bring this complaint to the United Nations. So much for the point made by the representative of France, that the complaint made to the United Nations was not authorized by anyone. We should have thought that the authority of the Prime Minister was sufficient, but if it is held that the Head of State, the Bey, should have authorized the complaint, then we say that that authorization was obtained. After this, the Resident-General and General Garbay were called to Paris. They returned to Tunis on 22 March. The Resident-General immediately demanded a private interview with the Bey. The Bey received him on 24 March, but in the presence of all the Tunisian Ministers who were in Tunis at that time. The Resident-General informed the Bey that the French Government was prepared to resume negotiations, on the condition that the Cabinet should be dismissed and the United Nations complaint should be withdrawn. When the Bey refused, the Resident-General produced a document, signed by the French Foreign Minister, giving him, the Resident-General, full powers to act in any way he deemed suitable to re-establish law and order, I hope I shall have a later opportunity to explain what the phrase "law and order" means in colonial governments, and to protect French interests. The Bey replied that he needed time to think it over and that he reserved his position on this subject. The Resident-General gave him an ultimatum of three hours. This was the King of Tunisia, whom the French claim they befriend. Almost at the point of a pistol, with almost the worst methods of arm-twisting, this old and venerable King was being bullied by the Resident-General into giving him a formal answer which would satisfy the Resident-General's logical and constitutional conscience. What other conscience could it possibly satisfy? Seeing himself ill-treated in this manner, the Bey then cabled to the President of the French Republic, drawing his attention to the pressure exerted on him by the Resident-General in the name of the French Government and demanding the recall of the Resident-General. During the same night, the Resident-General arrested the Tunisian Prime Minister and three other Tunisian Ministers. The fourth Minister who was present in Tunis, Sadullah, was not arrested, because he was very old and ill. But this old and sick Minister demanded that he should be arrested by the French authorities in order that he might accompany his colleagues into captivity. All were sent to the South of Tunisia. At the same time, the great nationalist leader of the Tunisian people, Bourguiba, who had already been incarcerated, was transferred with his companions to the South. Hundreds of political workers, journalists, teachers, lawyers, who had shown nationalist sympathies were arrested. All nationalist newspapers were suppressed. All high schools were closed. Martial law was applied. We have no means of ascertaining the number of arrests allover the country, but it is perfectly obvious that the large concentration camps must contain literally thousands of people. The Bey's Palace was surrounded by troops. The Resident-General visited the Bey on the morning of the 25th, but no one was allowed to be present during the interview. It was after this interview that the Resident-General declared that the Bey had consented, that a decree was to be issued in the Bey's name. It does not, so far as we know, bear the Bey's signature. So far as we know, what happened between the Resident-General and the King of Tunisia inside the closed room could not have been very pleasant for the Bey. But the Resident-General, as he walked out of the room, told those present -with grim humour - that what had happened inside had been "a feast of love". It was a cruel, sadistic joke to play on an old man, all of whose companions had been taken away and who had been left there to face as best he could this terrific military pressure of the French authorities in Tunisia. That is the situation as it now exists. Mr. Baccouche, a figurehead who has been propped up by the French, is the Prime Minister. How long he will last as the Prime Minister we do not know, but if I were to venture a prophecy, I would say that either his own sense of shame or the sense of shame communicated to him by his nationalist brothers in prison will make him drop this post as soon as possible. In any case, up to this time he has not been able to muster one single Minister for his Cabinet. Yet the French authorities, we are told, stand there waiting with beautiful reform schemes and plans of autonomy. With whom are they going to negotiate these-plans? With whom are they going to have these conversations? Or is it the intention of the French authorities to discuss these plans at a table with the French sitting on both sides? Do they merely want to negotiate these terms with their own stooges? If they mean business, if words have not lost their meaning, and if they do want to reach an understanding, it is essential - not only in the name of humanity, but also in the name of ordinary wisdom and logic - that they should negotiate these terms with people who, on their side, can deliver the goods. What is the good of discussing these terms with people of their own making? That is how the situation stands at the moment. Yet the French representative tells us: Perhaps a few weeks ago the situation might have warranted discussion by the Security Councilor the General Assembly but not now. The worst is over. From now on, an era of great peace, prosperity, happiness and friendship is going to dawn over Tunisia - with thousands of people of Tunisian origin in gaols, with the Cabinet in gaol, with all the great leaders of the nationalist movement - persons who have for years been respected not only at home but also abroad - in gaol. Is this the new era that is going to dawn? And at this stage we are asked not to discuss this question. This is my first intervention, and I would like to make it very brief, because I know that time is short and I know that other delegations want to speak too, I will reserve the right to speak again on this subject, but, before I finish, I would like to make one remark: so far as our information goes, we may not succeed in getting seven affirmative votes for the adoption of the agenda. Nobody would be more pleased than we to find ourselves mistaken in this estimate. Of course, as my colleagues know, because seven affirmative votes are required, an abstention has exactly the same effect as a negative vote. Up to this time our feeling is that seven affirmative votes will not be cast. In other words, this item will be submitted once more to the same fate to which the Moroccan item was submitted in Paris. Yet there are eleven nations which have brought this item to the Council. They are Member Nations. They are not irresponsible people who walk around the corridors of the United Nations; they are the United Nations. They are a substantial part of the United Nations. They believe in it, and they consider that this is the only body to which they can come to redress the wrongs of people who have no other recourse. Would it please the French Government if the Tunisians, agitating for the redress of their wrongs, should do so from irresponsible points of vantage? Is there any organization to which they could do better to come than to the United Nations? Where else would the French want them to go? I would repeat that question for all the Frenchmen who sooner or later might get extracts of this speech. Where would they want the suppressed Tunisians to go if not to the United Nations? What is the United Nations for if a situation like this cannot be aired here? What are we to understand to be our functions around this table if a suppressed people cannot raise its voice here, through eleven responsible nations representing, as my colleagues well know, the whole of Asia with a few exceptions and barring those which are not Member Nations. Practically the whole of Asia knocks at the door of the United Nations. Does it say, "Please punish the French"? God forbid. Does it say, "Please make the Tunisians free tomorrow?" At this stage it merely says one thing: "Please, in heaven's name, discuss this question." But, if seven members of the Security Council are not available to discuss if, it will amount to this: that the eleven nations are told, "You can go to hell. We will not discuss your question. You may feel strongly about it, but we will not even put it on the agenda to find out what the truth is." We are like people who have seen a fire. We are not guilty of arson ourselves; we have just seen the fire, and we have come and reported it to the fire department here, saying, "Please, will you look at this fire and put it out?" The fire department says, "We will not even look." This is a strange situation. But we will go on taking an interest in this question because of the feelings we have for suppressed people whom we regard as our brothers. It was not so long ago that most of those who have put their signatures to these letters were suppressed themselves. So much time has not passed that they should have forgotten the iniquities to which they themselves as subject races were exposed. Therefore, it is very difficult for us to forget the plight of the Tunisians, and we should like to tell them that, whatever the action the Security Council, in its wisdom, may wish to take, (there may be people around the Security Council table whose action might amount to saying, "We do not even want to look at this matter. ), we will at least keep this flame in our hearts alive and we will do the best we can. That is where my delegation in this intervention would like to stop. The representative of France has referred to certain incidents of past history. My delegation reserves the right to refer to them also and to expose still further the situation in Tunisia, the colonial conditions that exist there and the basic reasons for the whole of this agitation. For the present, we are only taking part in the procedural debate and, although my speech, I confess, had certain points of substance in it, these were roused mostly because the representative of France had also thought it fit to include points of substance in his. That concludes my intervention as the representative of Pakistan.